Labs are known for their boundless energy and their great love of play of all kinds. And while they can often be amused by very simple games, adding some great for them dog toys into the mix at playtime will not only help keep them happy and well-exercised but can help provide them with the mental stimulation these smart pups crave as well. With all of this in mind here is a look at seven of the best dog toys for labs. Always supervise your Lab when he gets a new toy. This engaging, versatile toy is a great choice for energetic Labs. It is designed to wobble wildly when pushed, prodded or shoved, but not to fall down, just like the Weeble toys of old. The balanced and weighted base keeps Bob-a-Lot 'grounded' but when it is tipped in the right way, pups are rewarded with a treat. Almost any kind of treat can be added to the toy and the difficulty level of the puzzle can be varied with relative ease, so that once your Lab thinks they have the game all figured out you can change things up and start a new one. It's a great way to exercise both their body and their brain. 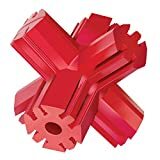 Pet parents who have purchased this toy for their pup report that it really can give Labs a mental and physical workout, as it bobs quickly and quite erratically and pups have to think quickly and move quickly to figure it out. A tire is a great shape for a playful Lab to interact with but playing with - and chewing on - the real thing is neither practical or safe. 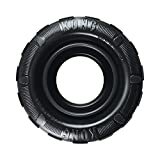 The KONG Tires Dog Toy, which is a very popular choice with pet parents of all kinds of pups, mimics the look, function and feel of a real tire but in a smaller, easier to manipulate, dog safe form. The KONG Tires Dog Toy comes in several different engaging colors and its 'treads' make it easier for pups to grip and pick up. While the toy boasts the durability that all KONG toys are known for it is not so rigid that it is too hard to play with and has a nice, bouncy action that can make all kinds of games fun. The tire can also be used as a treat dispensing puzzle toy, as it's 'inner tube' can be stuffed with the treats of your choice. Those who have purchased the tire agree that it is as durable as hoped, and can stand up to even power chewing pups. The puzzle element is popular as well, as the level of difficulty is just hard enough that a lively Lab will have to work to get their treats, but not so hard that they get frustrated and abandon the toy. This dog ball toy offers a lot, even though at first look it seems rather simple. As its name suggests this glow in the dark orb looks like a rather attractive full moon, but it is in fact a very durable, but also very bouncy ball that is designed to be the ultimate addition to a game of fetch, either on land or water. The ball also features a treat spot, which allows pups to puzzle themselves goodies out as they play, adding an extra element of engagement. It is also infused with peppermint oil, a soothing but energizing scent that many dogs love. I have one of these for my dog and I fill it with small training treats. Luna however, is designed to be a ball toy, not a chew toy, and while it is quite durable both the manufacturer and many online reviewers advise against letting your pup use it to chew on. Other pet parents report that the ball is engaging, and fun for their pups to play with an some pups, their pet parents report have actually had the same ball for years. Although this is not, as we mentioned, a chew toy some reviewers do state that if play does lead to a power chewer trying to chew the ball it stands up to that rather well until it can be retrieved and put away until the next play session. We should begin here by stating, as the manufacturers of this dog toy this toys claim to be “indestructible”. But in reality there is no such thing as an indestructible dog toy. But according to many online reviews this engaging ball toy does come really close to it. This brightly colored ball is designed to replace flimsy and easy to damage tennis balls in games of catch or fetch both in and out of water, as its brightly colored exterior is waterproof and it floats very well. The hard construction of the ball makes it very hard to bite, leading to the indestructible tag in the name. Online reviews from pet parents overwhelmingly agree that the ball is very, very tough and some pet parents whose pups can usually destroy any ball very quickly are pleased - and even surprised - that the Ruff Dawg ball has survived intact for months. Many also remark positively on how well the ball bounces, making it a lot of fun to play with for both pups and their humans. The perfect dog ball toy for your high-energy Lab. 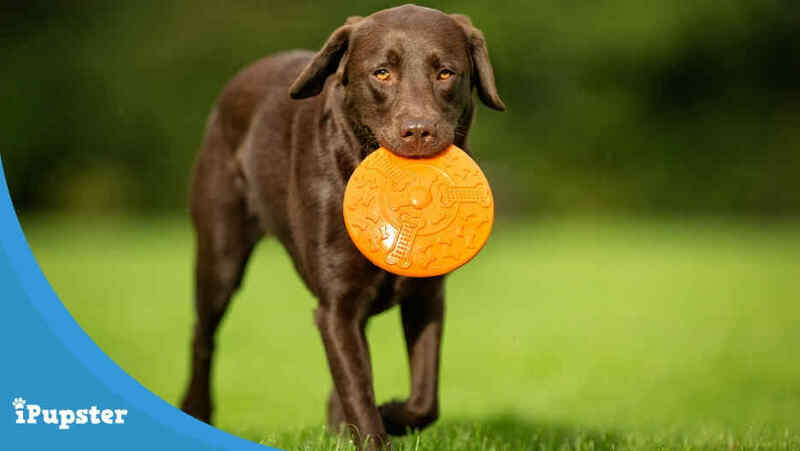 Many labs - like lots of other dog breeds thrive when they have access to a variety of different kinds of dog toys including one that can act as a cuddle buddy at nap time as well as an engaging toss or tug toy as a part of more active play. The challenge for pet parents when it comes to this type of dog toy however is finding one that their Lab will not reduce to a messy pile of stuffing in just a few hours. Many of those who have purchased the Crazy Critters Raccoon have great things to say about it. Many find that it is longer lasting and more durable than most soft dog toys and while in some cases the raccoon's squeak did not last very long as it remained in one piece it was still safe for play and most pups did not seem to mind that it was not 'talking' anymore. KONG toys are famed for their durability and the Jump'N Jack Dog Toy lives up to that reputation according to most online reviewers. If you have ever played jacks you'll recognize right away what this toy resembles and why it has its name. Each 'arm' of the tough rubber toy makes it easy for both dogs and humans to grasp and catch, and as durable as it is it is also lightweight enough to travel quite a distance when used in a game of fetch. That's not all the Jump'N Jack offers though. It also makes a great, durable chew toys and even features special grooves that help clean a puppy's teeth and dislodge any trapped food as he chews. Pet parents who have purchased the KONG Jump'N Jack generally agree that the toy is both durable and engaging. Different pups use it in different ways, some preferring to use it in solo play as a chew toy, while others enjoy its bounciness in a game of fetch. And a few reviewers even suggest that if dog toothpaste is added to the ridges of the toy it makes its tooth cleaning abilities even more efficient and effective. This is another plush cuddle toy that is designed to be a little more durable than most and better stand up to the often very energetic play of the average Lab. It is rather plush and has a nice fuzzy feel - making it an excellent naptime cuddle buddy choice, but its minimal stuffing and longer length allows it to be used as a fun tug of war toy as well. It also features two squeakers for added engagement during play. Online reviews are positive in terms of the toy's durability with many reporting that the raccoon lasts longer than many other stuffed dog toys and that even the squeakers have unusually long lifespans. Some pet parents also comment on how well it stands up to a rougher game of tug and how much their Lab enjoys the raccoon as a cuddle buddy too. The dog toys on this list are just a handful of those that are available, there are, of course, many more and many of them are as much fun. When buying toys for your Lab though try to keep both their personal play style and their energy levels in mind. Very lively smart pups will definitely benefit from great throw and tug toys while those who love to chew will benefit from a good durable interactive chew toy that also has a puzzle element, as that will help stimulate their active, inquisitive minds as well. Usually the biggest key when shopping for the best dog toys for your energetic lab is that it is a durable choice. As larger pups Labs do tend to be 'harder' on their toys than smaller dogs, and as most Labs do love to chew - especially when they are younger - any chew toy should be as tough as possible. It should be noted - again - however, that an indestructible dog toy really does not exist and that any toy that becomes damaged or broken should be removed from your pup's toy box and retired and replaced! What’s your Lab'​s favorite toy and why?